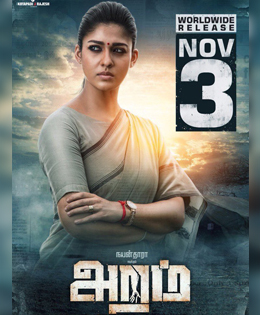 Nayanthara's most anticipated next Aramm, is a women-centric movie which portrays Nayanthara as a District Collector, who deals with some serious social issues. Directed by Gopi Nainar, the film is bankrolled by Kottappadi J Rajesh, with Ghibran as the music composer. Aramm was first supposed to be released on September 29 for Ayudha Pooja, but then was pushed to October 19, that is a day after Diwali. And now, the makers of the film released a poster with a final release date - November 3. It must be noted that November 3 is the day that has also been allotted for all the new movies which was halted in respect of Tamil Film Producers' Council decision, to be released on. In addition, Nayanthara's film with Sivakarthikeyan Velaikkaran was also initially slated to be released on September 29, but due to hectic post production work it was postponed to a much later date - December 22.